Happy New Year, Far Out fans! If you’re like us, your newsfeed and all other relevant social media posts are currently flooded with the usual New Year’s Resolution’s: eating healthier, hitting the gym, shedding pounds, yada yada. Quite frankly (and we don’t think we’re alone on this one) your gym selfies and salad Instagrams really don’t make us all that “happy.” Unless you’re in Florida with us lucky ducks, you’re probably freezing your tush off and the last thing you need to see is a picture of a frozen acai bowl. We’re all for bettering yourself but why can’t bettering yourself be pushing yourself to the limits by doing something FUN like, say, winning a po boy eating contest? It’s just counter-intuitive to spend winter restricting and burning your calories, you need those extra calories to stay warm! Hibernation, people. But I digress. We are here today to dilute your New Year’s newsfeeds with a blog post about a good ol’ fashioned eating contest. Not a salad eating contest, a po boy eating contest that took place back in September when all New Year’s resolutions had long since been tossed astray. Po Boy Jim is an awesome local spot in DC with rave reviews from loyal fans and curious foodies alike (just look ’em up on Yelp or follow them on Facebook). Back in September, Po Boy Jim was taking part in a street festival and thought: if people are coming here to gorge on food, why not do it for a prize? That’s our kind of logic right there. Just like Po Boy Jim is the place to go if you’re looking for some authentic NOLA cuisine in DC, Far Out Awards is the place to go when you’re in need of a food award (or any award for that matter). When Po Boy Jim reached out to us for their event, we didn’t have any fake po boy’s to use for their Far Out Award. That’s never an issue though, we specialize in making custom awards and always love the challenge of creating something new! So we set out on a mission to make the very first po boy Far Out Award and what we came up with, if we do say so ourselves, was pretty epic. 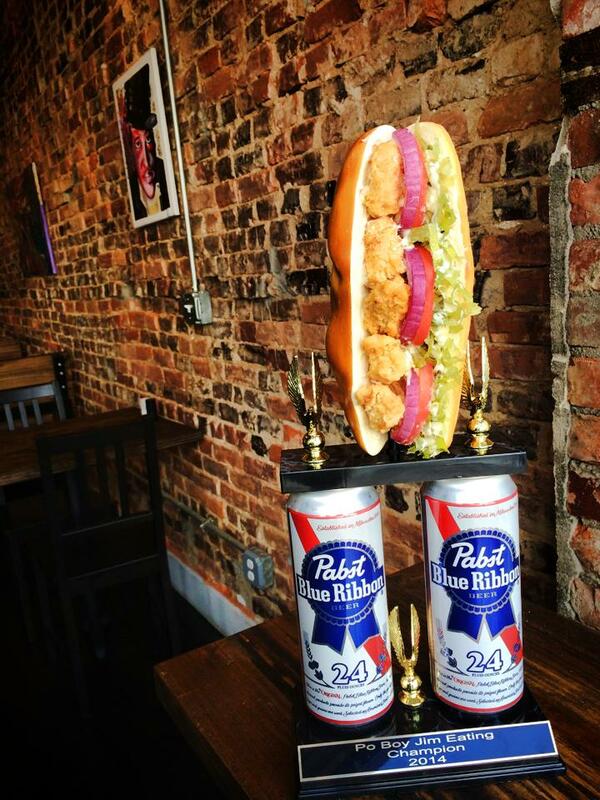 Not only did our Po Boy come out looking absolutely delicious, but we really think the PBR columns were a perfect touch for this classy event. The winner of the po boy eating contest would have their $10 entry fee refunded, take home the awesome custom Far Out Award, and have a chance to customize a po boy named after them to be on special at Po Boy Jim’s the first week of October. Far Out! 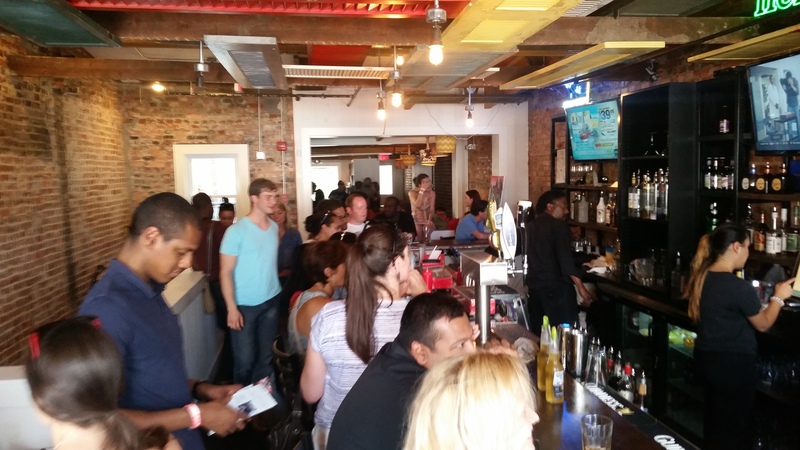 The event was a huge hit, Po Boy Jim’s was flooded with traffic and while only one hungry winner got to take home the Far Out Award, we assume everyone left full, warm, and happy. Full, warm, and happy is what we think a New Year should be, and that is why we chose this Far Out event to be featured as our Happy New Year post. We resolve to bring you many more stories like this one in 2015 so if you ever need a break from the healthy hype, you can count on Far Out Awards for some sinful indulgence. If you want your story to be featured on the Far Out Blog or need help building a Far Out Blog-worthy trophy, contact lindsey@faroutawards.com for more information.